PushNPutt’s interactive putting green flag poles will set your course, indoor putting green or backyard practice area apart from the rest! Our patented design offers golfers a brand-new experience when practicing their putts. For more putts per session, less time retrieving golf balls and less wear and tear to your turf, purchase our putting green flag poles today! Jerry Mallonee is the mastermind behind our design. He became inspired to create this innovative product while playing a round of golf with his father-in-law. Jerry noticed that when his father-in-law went to retrieve his golf ball, he had some difficulty. That’s whey Jerry went over to help and noticed the year “1958” stamped on the bottom of the cup. With so many innovations that have happened in the world since the late 1950s, Jerry realized that not many had made their way to the golf industry. He decided that he could improve on traditional putting green flag poles to revolutionize the game. Our patented design is all in the name. Simply push down on our putting green flag poles, and start putting! Your golf balls are raised and equally dispersed onto the putting surface. Our flag poles are connected to a rising false-bottom cup that takes the effort out of retrieving golf balls. Save the stress on your back and knees by purchasing our patented putting green flag poles. In addition to increase your putt time and reducing stress to your joints, they also protect your surrounding turf! In order to avoid bending over, some golfers will attempt to dig out their golf balls from the cup with their putters. This can damage both the cup and the surrounding turf. But with PushNPutt, there’s no need to dig out golf balls. Simply push down and start putting! Minimize maintenance and repair costs by installing our putting green flag poles on your course or practice area. In addition to adding a “wow” factor and a customizable flag, you’re also increasing your putts per session. And because our flag poles come in a variety of finishes, colors and flags, you can make it your own! 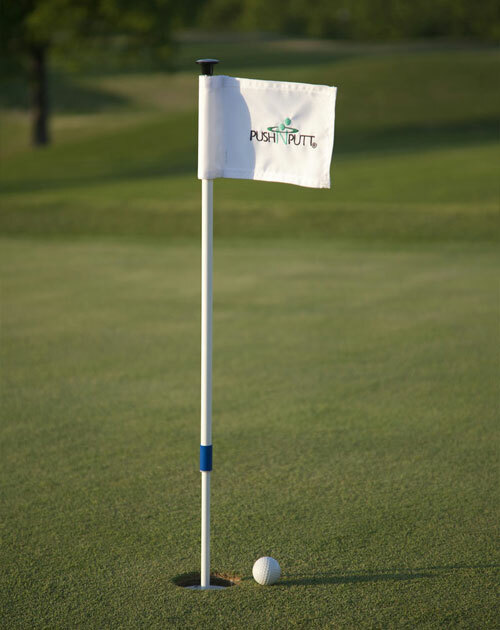 In addition to our original PushNPutt model, we also offer two additional types of interactive putting green flag poles. Our LiftNPutt model functions similarly to the PushNPutt product. But instead of pushing down on the flag pole, just lift up! Your golf balls will be lifted up and out on the putting green. And they won’t fall back into the cup! Our PutterUp flag pole is a mini version of the LiftUp model. It’s compact size is perfect for practice putting greens, and it comes with a handle affixed to the top of the pole. Simply hook your putter to the handle and lift up gently to continue putting! All PushNPutt products feature high quality materials like stainless steel and outdoor plastics. They have been tested and proven to withstand all weather conditions. And they’re all American-made in our North Carolina facility. They even come backed by a one-year warranty! For the best putting green flag poles available on the market, contact PushNPutt today!